Gina Gaston originally came to KTRK-TV, ABC13 in the fall of 1992 to co-anchor the then newly expanded, and later top-rated 13 Eyewitness News at 6am. 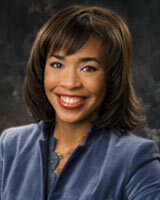 She continued as an anchor/reporter until 1999 when she left the station to move to New York and work for MSNBC. She returned to ABC13 in June 2001 to again serve as a reporter and co-anchor, but this time for the Eyewitness News at 6pm and Eyewitness News at 10pm. Among the stories Gina covered while with 13 Eyewitness News, were the O.J. Simpson trial in Los Angeles, the Rockets Championships, and the Democratic National Convention. During her time away from ABC13, Gina not only worked at MSNBC, but also married former Houston Rocket basketball star Mario Elie (whom she met while covering a Rocket championship game). At MSNBC, Gina was a network correspondent anchoring the 2000 presidential election from coast-to-coast, including the Florida ballot recounts. She also anchored President George W. Bush's Inaugural activities, Elian Gonzales' departure to Cuba, the U.S. bombing in the Iraqi no-fly zone, the Mid-East Violence and the South American earthquake. In addition, she also filled-in as anchor for NBC's Weekend Today show. Among those she's interviewed are Senators Kay Bailey Hutchison, Olympia Snowe, and Hillary Rodham Clinton. Plus the Reverend Jesse Jackson, the Duchess of York Sarah Ferguson and Oklahoma Governor Frank Keating. Before joining 13 Eyewitness News in 1992, Gina worked as an anchor/reporter at WTSP-TV in Tampa, Florida and as an anchor/reporter at WHTM-TV in Harrisburg, Pennsylvania and KLTV in Tyler, Texas. Gina is a member of the National Association of Black Journalists and was honored by the Associated Press Broadcasters for News Reporting. She is a graduate of the University of Southern California and is a native of Santa Barbara. An ex-NFL star and his wife are the brains behind Spring's new Legacy: The School of Sport Sciences. When UHD's 2018 graduates cross the stage on Saturday, the youngest will be 19 while the oldest will be 69. A new Coalition for the Homeless report shows nine percent of homeless people found in Houston were never homeless before. Nearly every motorist has to get gasoline for their car at some point, and sometimes those pumps could be compromised. The Houston legend recalls his time spent with Barbara Bush during his 56-year career.